In the spring I planned to visit this late medieval church during the summer to view and photograph the many superb carvings at the site. 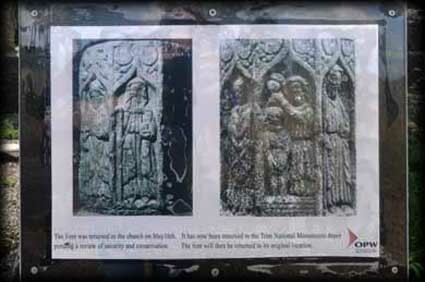 The church was in headlines news in May as it was reported that the medieval font had been stolen sometime in April. I was quite shocked and saddened to hear the news. Fortunately the artifact was returned sometime in late May. I drove up to Rathmore today only to find the font had been removed by the O.P.W. to the Trim National Monuments Depot for a review of security and conservation. The octagonal shaped font is 2ft high and bears carvings of eight apostles on the side panels. The monument is valued at around a half a million euros. The simple L-shaped nave and chancel church was built by Sir Thomas Plunket in the middle of the 15th century. The church, which is dedicated to St Lawrence, has a tall bell tower in the southwest corner. In the northeast corner are the remains of a three storey building that contained the sacristy. It is a sheer joy to stroll around the interior of the church admiring the many carvings and features on view. 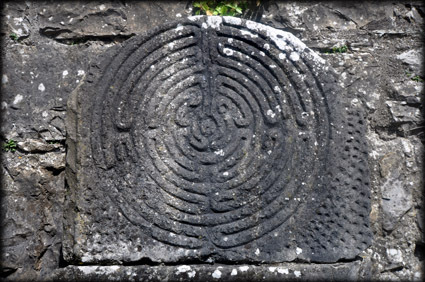 These include a labyrinth stone similar to the one found at Hollywood in Co Wicklow, now on display in the Glendalough visitor centre. 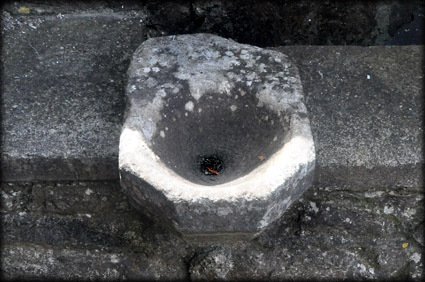 Other features include a piscina ( where the priest would wash his hands and the vessels for the mass), a sedilia and an altar with weepers carved on the end panels. In the centre of the church there would have stood a wooden gallery. 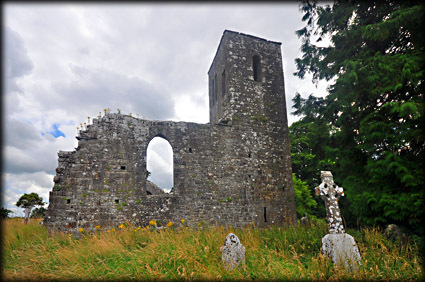 The church is of a similar design to the churches at Dunsany and Killeen. 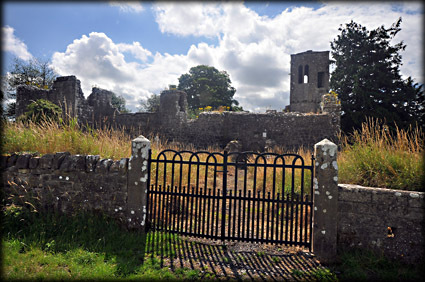 At the end of the 14th century, Rathmore Manor was held by the de Verdons before passing by marriage to the Cruise or Cruys (original spelling) family. 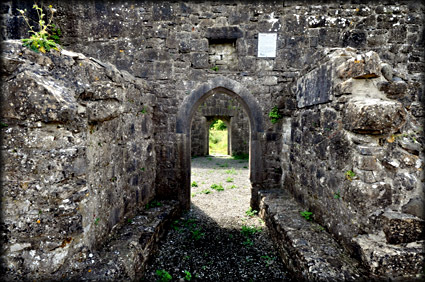 Later Mary Anne or Marion Cruise became the second wife of Sir Thomas Plunkett ( Lord chief Justice of the King's Bench in Ireland ). 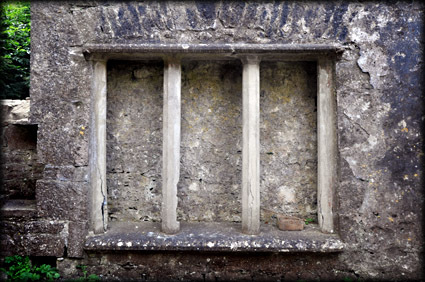 It was held by the Plunkett family into the middle of the 17th century. 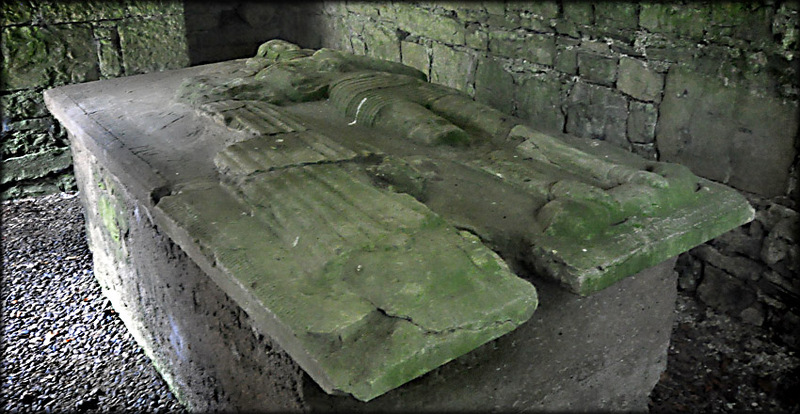 The effigial slab now situated in the sacristy is believed to be that of Sir Thomas d.1471 and Marion who died later. 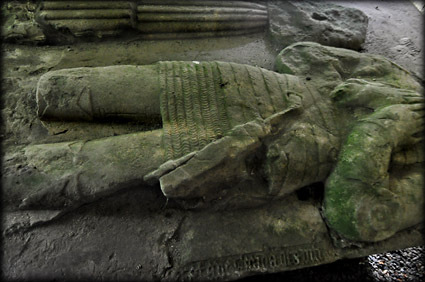 Sir Thomas is depicted in full body armour and his loyal dog rests by his feet. Sadly the effigy of Marion is badly damaged. In an adjacent field to the church is the ivy covered Rathmore Castle, the residence of Sir Thomas and his wife Marion. 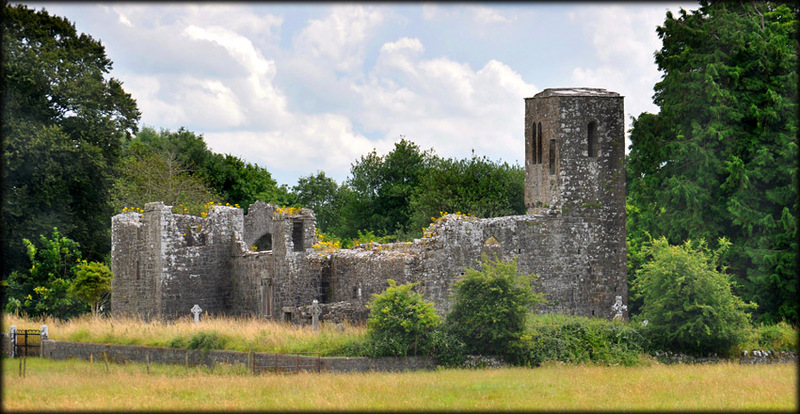 The Plunkett family also held the castles at Dunsany and Killeen in Meath and built Dunsoghly Castle in Fingal. 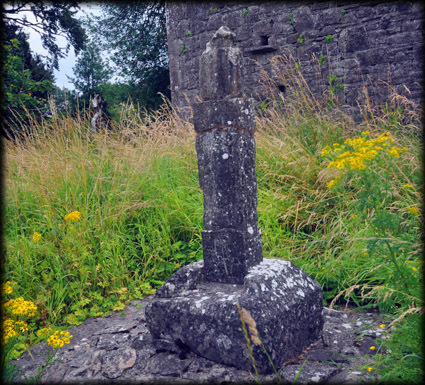 A cross erected by Sir Christopher Plunkett. Situated: From Navan head west on the Kells Road. At the first roundabout take the first exit onto the N51. After about 12.5 kilometres you will see the church in the field on your left. Access is through the gate facing the church. Discovery Map 43. N 7456 6652. Last visit July 2013.